Perhaps it’s a holdover from the Apple Depression of the 1990s, but I sometimes wonder where I would go if I ever needed to leave the Mac. I hear you asking, “Why would you ever need to leave the Mac, stupid? God, you’re so dumb. And stupid.” Well, those are fair criticisms. These days it’s obvious that the Mac isn’t going anywhere, so this bunker mentality is certainly an anachronism. Let’s say, then, that rather than deciding to leave the Mac, I was asked to leave the Mac. That seems more likely. One day Apple just calls me up and says “You know, we’d rather you didn’t use our products anymore. You’re dragging the brand down.” I could see that happening. I used Windows professionally in my work for The Man, and I hated most of it. Fortunately, it was only for 20 years, so no big deal. Because of this experience, though, if I had to move, my first choice would be to see if I could make it after all—Mary Tyler Moore–style—in the Minneapolis of computing. I’m speaking, of course, of Linux. But not long ago I experimented with Linux and, like many walks on the wild side, it left me let down, confused, and questioning many of my initial assumptions. Once you’ve decided to dip your toe into the open waters of Linux, which waters do you choose? There are so many waters. Ubuntu and Fedora are popular desktop distributions for Linux, but I decided to start with Ubuntu because it’s more fun to say. Try saying it out loud and I think you’ll agree. 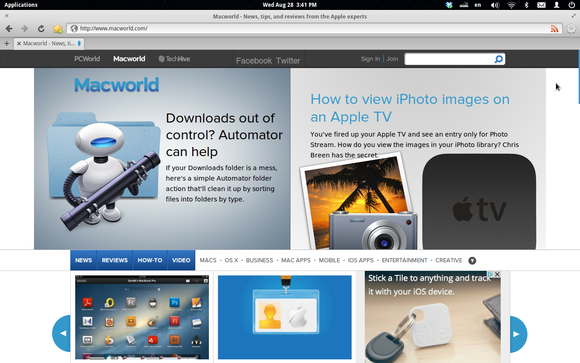 Ubuntu isn’t so bad—but for a long-time Mac user, the experience can be uninspiring. Visually, many of the applications seem to be stuck in the Microsoft-Access-2002 era. Linux is known, not for its design, of course, but for getting the job done. For free. Or so it’s been to date. But Ubuntu isn’t the only fish in the open-source ocean, if I may mix my metaphors. Enter Elementary OS. Elementary is a relative newcomer, having first shipped in 2011. 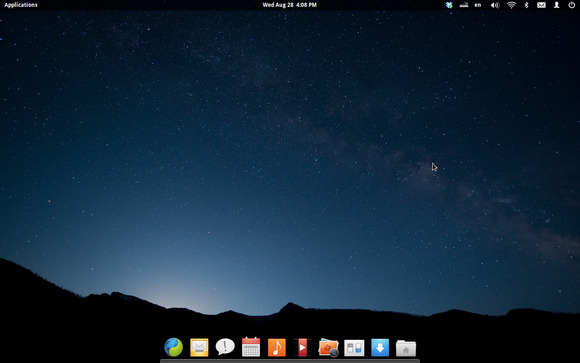 The latest release, Luna, came out in mid-August and presents a distinctly different design sense than Ubuntu, and one that Mac users might find more appealing. … a demonstration of a desire to create a Linux-based OS that championed consistency and great design. Well, I didn’t want to say anything, but I’m glad someone’s finally trying. Some of Elementary seems directly inspired by the Mac OS. In fact, if Jony Ive ever gets around to flattening the icons in OS X, you might have to look closely to tell the two operating systems’ desktops apart. 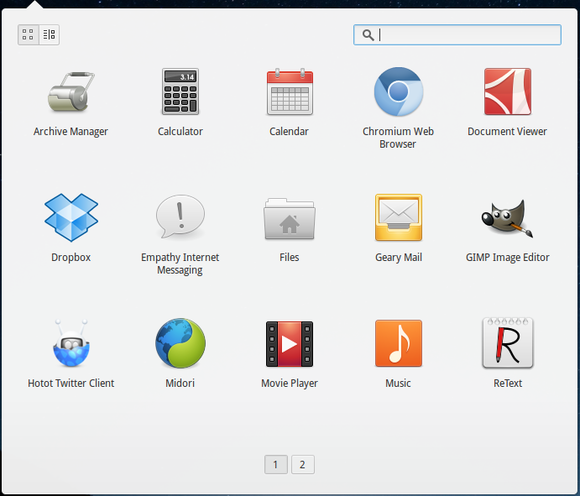 Go for launch: The application launch menu in Elementary OS might remind you of OS X’s Launchpad or iOS. There’s a dock, which works just like the Dock on the Mac and is even called “the Dock” (Apple’s Dock, of course, is not unique). The Music application is the spitting image of iTunes. The text editor saves your file as you type. Applications save their state on exit and restore when relaunched. Scroll bars are thin by default. The Applications menu acts just like Launchpad. The strawberries taste like strawberries, the snozzberries taste like snozzberries. Indeed, my first reaction was something along the lines of “Heh. Nice ‘homage,’ dood. LOL.” Or it would have been if I talk like that which, fortunately, I don’t. But rather than completely dismiss Elementary, I decided to give it a try. Why not? You can download it for free, as you can any other Linux distribution, but they’d love it if you kicked in $10 (which I did). I can’t believe it’s not iTunes: The built-in Music application in Elementary OS resembles its Apple counterpart. I had an old MacBook lying around and, though it was a Core Duo and couldn’t run the latest version of OS X, it could run Elementary. The installation process was easy enough for me, but your mileage may vary depending on the availability of drivers for the specific hardware you’re running it on. The system requirements are very modest—a 1GHz processor with 512MB of RAM—because under the hood, Elementary is based on Ubuntu. I don’t know if you’ve looked at many cars recently, though; the hood actually matters. Apart from a veneer of Mac-like elements, much of Elementary OS is quite different. Applications designed specifically for Elementary don’t have menus, for example. Instead, options are nested inside a gear icon on the app’s toolbar. It’s slightly less informative, as all items are on one level and divided into groups by lines and lack an identifier for categories such as File and Edit. But it’s also a cleaner look. Message for you, sir: Geary, Elementary OS's mail client, bears some resemblance to iOS's offering. The default email client, Geary, is very bare-bones—closer to Mail on iOS than to Mail on the Mac—but the login screen seems more Androidy. So while some of Elementary OS is inspired by the Mac, much of it also seems inspired by today’s mobile operating systems. That’s a smart way to go, as mobile devices are, if you haven’t heard, quite popular these days. And if Elementary seems less feature-rich in its GUI, remember, this is still Linux, so pretty much everything is configurable one way or another. Of course, Linux giveth and Linux taketh away. In order to play my music, Elementary first required me to download and install plugins to play each kind of media file I had loaded. I’m sure there’s a licensing reason for this or something. While it was relatively easy and you only have to do it once, it’s still annoying and not terribly user-friendly. I have quibbles with some of the design choices, of course. If you’re going to use drop shadows, they shouldn’t be around the entire window. Those of us who’ve become accustomed to Apple’s “natural” scrolling would appreciate having an option to invert scrolling. And the progress windows during installation should have a fixed width instead of constantly resizing depending on the length of the text they’re displaying. Despite these nits, this OS behaves as if it were deliberately designed by a core group of people who know what they like, instead of being voted on in a committee. And that’s a good thing. Sure, Elementary is still quite rough around the edges, but in ways that remind me of Cheetah or even Puma. While it’s true that there are “thousands” of applications for Elementary, almost all of them are Ubuntu applications that don’t save states on exit and that have menu bars instead of the gear icon. Maybe that’s analogous to the Classic environment in early iterations of OS X. You can use those programs, but it detracts from what Elementary is trying to accomplish from a design perspective. Elementary’s future is full of challenges. The Ubuntu “brand” is the de facto standard bearer for Linux these days, and could be hard to supplant. I also have my doubts as to whether most Linux users care that much about design. But appealing to most Linux users probably isn’t the way to grow the overall user base anyway. Every year we’re told how this will be “the year of Linux on the desktop”; really, most Linux users would still be happy with a fortnight of Linux on the desktop or a three-day weekend, let alone a whole year. As a Mac user, I can’t see recommending Elementary over Mac OS, at least not until I am actually asked to leave the platform or Tim Cook gets up on stage and rips off his mask to reveal he’s secretly a hideous gorgon bent on turning mankind into a race of slaves feeding the brood buried deep under One Infinite Loop. But it’s still nice to have choices. And if you have an old Mac or PC lying around in want of a modern operating system, Elementary seems like the design-conscious computer user’s best open-source choice. At least that’s something.